His Excellency Prime Minister Dr. Haider Al-Abadi has received, Today on Tuesday, U.S. Special Presidential Envoy for the Global Coalition to Counter Daesh Mr. Brett McGurk, deputy assistant secretary of state for Iraq and Iran Mr. Andrew Peek and the United States Ambassador to Iraq Mr. Douglas Silliman. 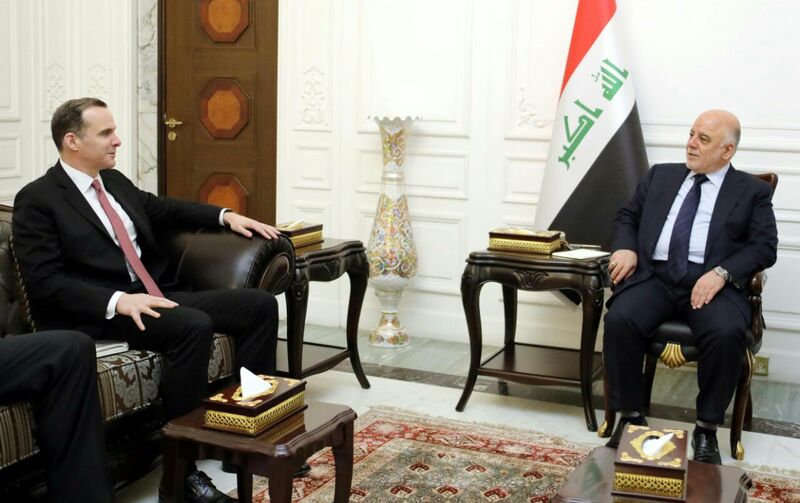 During the meeting, they have discussed the relationship between the two countries, the political, security, and economic developments, the stage of construction and rebuilding in Iraq, the situation in the region and the elimination of the remaining terrorist's gangs cells. Dr. Haider Al-Abadi has confirmed Iraq's insistence on the success of uniting the Iraqis towards the goal of reconstruction and providing a positive environment for investment. His Excellency has pointed to the importance of stability in the region and to prevent the causes of tension, focusing on ending terrorism. Mr. Brett McGurk has said that the United States believes that Iraq is moving in the right direction, stressing his country's support for Iraq in the rebuilding and construction phase and the strengthening of security. Mr. Brett McGurk has expressed the United States' support and its backing for Iraq's position on the need to end remaining of Terrorists pockets in Syria and fortify the Iraqi borders from infiltration attempts by terrorists.